Leading a football team in tackles is an impressive feat for anyone and is an accomplishment typically achieved by veteran linebackers. This is what makes first-year Jackson Ross so special, as he led the Maroon defense in tackles as a rookie defensive lineman still learning the collegiate game. 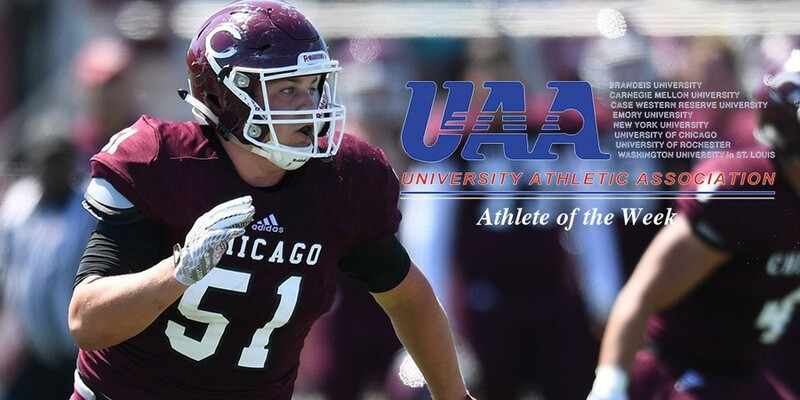 Ross totaled 85 tackles, 7 tackles for loss, two and a half sacks, two pass breakups, an interception, a forced fumble, and is en route to be named Maroon Male Rookie of the Year. Ross was also named Second Team All-MWC, MWC North Division Rookie of the Year, and UAA Athlete of the Week. Ross came in as a first-year and immediately impressed the coaching staff in summer camp while playing against much more experienced lineman. The six foot two, 265-pound defensive linemen from Oklahoma quickly locked down not only a starting spot but a premier role in the defense. While soft-spoken and friendly off the field, Ross is an absolute monster on it. Opposing offenses should be greatly concerned as Ross becomes more familiar with the playbook and speed of collegiate play, the two biggest challenges when transitioning from the high school game. Going into his second year, Ross incredibly still has potential to play even better than he did in 2017.